What to Look in The Best Tactical Boots? How to Find the Perfect Fit in a Tactical Boot? As a law enforcement officer, S.W.A.T member, or military personnel, you place yourself in dangerous situations on a daily basis. Your position requires specific work boots that are durable, flexible, and protective during any tactical situations that you find yourself in. Police officers, in general, have to be able to move into action without restrictions, so they require the best police boots available. Military personnel should be equipped with only the best tactical boots. Just as you rely on your partner to have your back, you should also be able to rely on your boots to get you through any sticky situation without faltering. For these reasons, we have provided information and reviews on the top brands of police and tactical boots. The Danner Tachyon GTX Duty boots are constructed of waterproof full-grain leather and a 100% waterproof and breathable Gore-Tex liner that is designed to keep your feet dry and comfortable when the weather or environment is not. For comfort, these boots are equipped with an EVA midsole for cushioning and shock absorption, which mean these boots take the abuse instead of your feet. They also feature a polyurethane footbed that allows for adequate airflow. A speed lace-up system with durable brass hardware provides ample support while allowing you to get the boots on and off fast. In addition, the outsoles are rubber with pentagonal lugs for superior traction and surface contact. Police personnel often like the option to polish their boots and this particular brand features a polishable toe that can be shined to suit inspection. If you are unsure about buying and returning boots through Amazon, don’t be! Amazon has a very friendly return policy that allows you to return or exchange the work boots you don’t like or want FOR FREE. Plus, if you are an Amazon Prime member, you can now use Amazon Wardrobe benefits to order up to three pairs of boots, try them all on, and only pay for what you keep. For those that require it, the Original S.W.A.T. Men’s Metro Air can pass through metal detectors without setting off alarms. This is particularly important, especially if you’re in a hurry. They include a polishable leather toe, and are constructed out of leather and Denier nylon upper. Another nice feature of these boots is the low profile, slip resistant outsole with waffle traction and ladder grip control to maintain your footing on various surfaces. In addition, your feet are comforted by the air cushion midsole and a synthetic liner that wicks away moisture. The included nylon shank supports your feet comfortably. These boots are equipped with a zipper for an easy on and off function but they are not equipped with a safety toe. The S.W.A.T. Men’s Metro Air provide ample support and cushioning for those who anyone that spends a lot of time on hard cement surfaces. 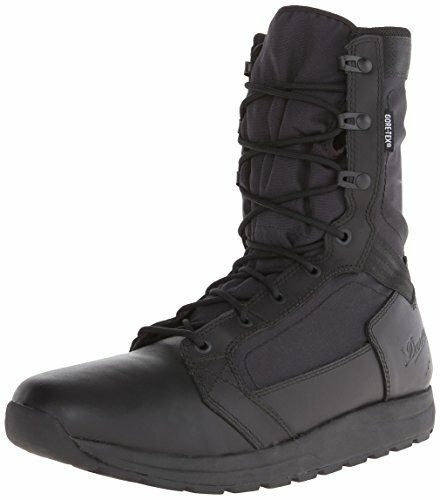 This makes this one of the most comfortable tactical boots on the market. Read about the pros and cons of zippers! 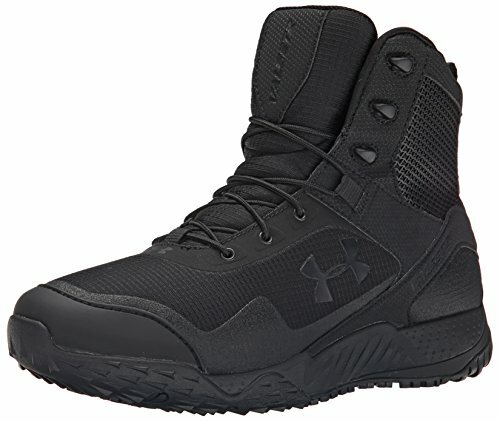 The Under Armour Valsetz is a lightweight tactical boot feels as though it’s a cross between a tennis shoe and a work boot. Specifically, it would be ideal for infantry use or obstacle courses as it offers flexibility and foot-strike guidance that allows you to easily transition from impact to propulsion. It also provides ample shock absorption and superior cushioning for your feet, especially in the heel and forefoot area. The fully contoured EVA midsole conforms to your foot and cushions in just the right places, plus an Ortholite sock liner is featured for even more cushioning and less slippage of the heel. The lining of these boots is breathable and water resistant, however, the exterior of the boot is water resistant but not waterproof. With an additional water-resistant application, the boots will be better protected from the elements. Equally important is the on and off-road traction provided by the rubber outsole, it’s also equipped with a textured, high-abrasion rubber toe to further protect your feet. Click to see how to make boots waterproof! 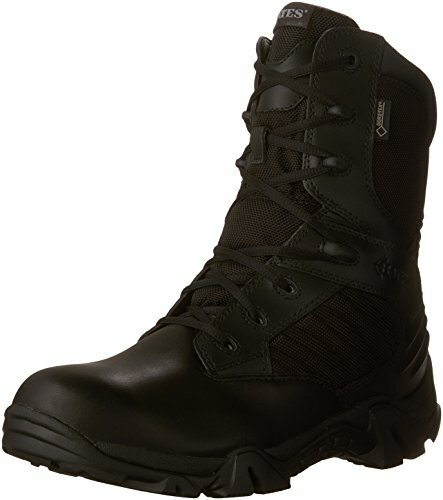 The Maelstrom Men’s Tac Force Boot is specifically designed for law enforcement and tactical professionals. Its lightweight design is both durable and flexible, allowing for easy movement in active situations. These boots are constructed with water-resistant leather and nylon upper, along with a breathable, moisture-wicking lining that prevents bacterial build-up and regulates temperature to keep your feet dry and comfortable during extended wear. In addition, a shock absorbing molded insole conforms to your foot and takes the impact of each step. Other comfort features include the removable, high-performance cushion insert and the padded tongue and collar. The rubber outsoles provide ample traction and grip to surfaces, plus they are slip resistant. 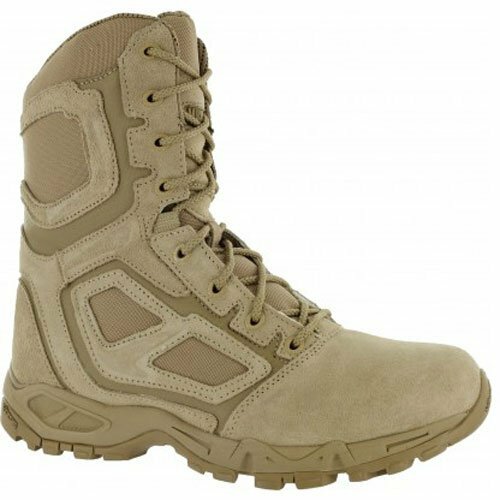 Designed for long hours of wear, whether you’re a soldier, security officer, or just in the market for a tactical boot, the Magnum Men’s Elite Spider provides ample comfort, even in very hot climates. The AeroMesh vent and the Spider Mesh lining provides moisture-wicking, and allow your feet to breathe, which keeps your feet dry during patrols in extreme heat conditions. A composite shank and the lace-up water-resistant leather upper delivers support, while the compression molded EVA cushion absorbs the shock of walking on pavement. This particular EVA cushion also lasts longer than the standard EVA. Furthermore, these particular boots are equipped with a high-density cradle layer that supports the arch and heel, plus an extra pad under the heel to deliver extra shock absorption. A soft top layer that contours your foot is incorporated into the insole. For traction and stability, the Elite Spider boots feature a durable Vibram outsole. Also, you won’t be setting off any metal detectors in these boots because all of the hardware is constructed out of a durable composite material. 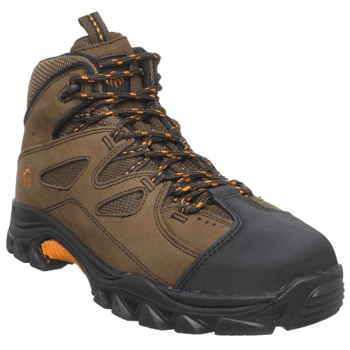 The Bates Ultra-Lites GTX Waterproof Boot weighs in at only 3 lbs. which is especially nice if you’re constantly on the move. They are waterproof, so your feet will remain dry through puddles or wet rainy weather. Constructed with a full-grain ballistic nylon and leather upper and with a fully cushioned removable insert inside, they provide support and ample comfort during long wear. 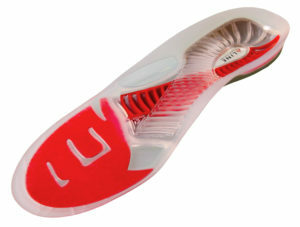 The Ultra-Lites outsole resists slips and provides great traction on various surfaces. This is a soft toe boot equipped with an easy side zip function enabling you to get your boots on and off quickly. For these particular boots, we would recommend choosing one size larger, as they tend to run smaller than average and they are not designed for those with wide feet. One of the great qualities about buying boots from larger stores such as Amazon is that they have an excellent return policy in case the size isn’t right. For those working in fields of public safety, such as firefighters, paramedics, and EMT’s, these boots might be an ideal choice. 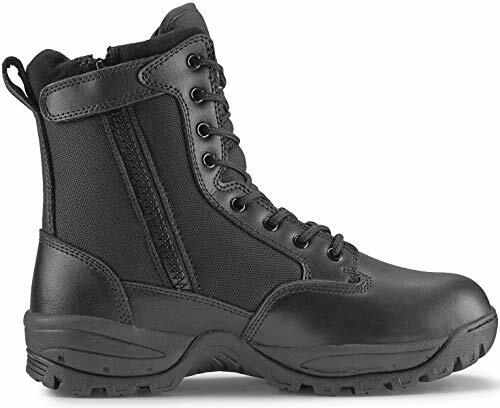 The hard-working people associated with law enforcement, military, or other public safety positions have requirements for a specific type of footwear that will keep them safe in the field and allow them to perform their job to the best of their ability. In order to do that, there are features that should be incorporated into their comfortable work boots. 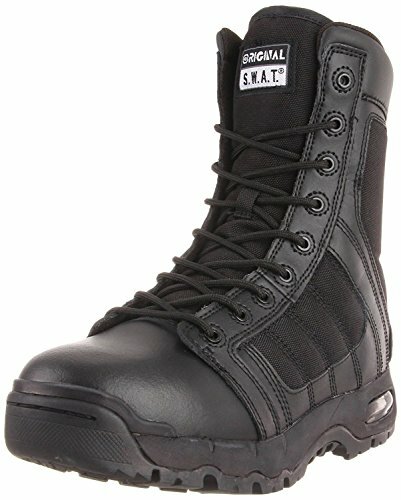 So, what are the qualities you look for in a tactical or police boot? There are three necessary components when selecting the proper tactical or police boot: support, flexibility, and durability. It’s important when out doing your job that you’re not distracted by irritating discomforts such as rubbing, soreness, and tired feet. Plus, you also require adequate protection from certain hazards that you might come in contact with. Waterproof or Water Resistant – If you’re subjected to the elements such as rain, puddles, or other bodies of water where there is a chance that your feet might become soaked, having a boot that prevents wet soggy feet and socks is necessary. “Waterproof” means that you can submerge the boot in water without getting wet. “Water Resistant” means that rain or splashes should be repelled but that they should not be submerged. Traction and Slip Resistant – This is another important feature to consider when selecting tactical or police boots, especially if you’re constantly on the move, running, jumping, or marching. You don’t have time to worry about whether your feet will slip out from under you. Traction provides the necessary grip to keep your feet firmly where they need to be. Zippers or Laces – Depending on your occupation and the support you require, you’ll have to decide on zippers or laces. Zippers allow for speed when you have to get your boots on and off in a hurry. 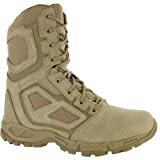 Laces, on the other hand, are easily adjusted for ample support and are ideal for military personnel who require their boots to deliver a secure fit. Read more the pros and cons of zippers. Contoured Cushioned Footbeds – If you have to be on your feet for long hours, you want a boot that provides that necessary comfort and cushioning for your feet. Shock Absorption – If you’re constantly on the move, pounding the pavement, or performing tasks that can punish your feet, shock absorption takes the stress off of your foot so that every step is cushioned instead of feeling that constant impact of hard surfaces. Breathable – You want a boot that breathes, to prevent moisture build-up and odor inside the boot. Sweaty, hot feet are uncomfortable, so having that mesh lining or air vents is an added bonus, especially in hot weather. You may have now found the boot that is right for your specific needs, but you need to make sure that the boot will fit your foot well. What’s a perfect boot if it doesn’t conform to your foot as it should? Here are a few tips that will assist you in properly sizing your boot according to the shape and size of your foot. First off, never assume that your boot will fit according to your normal shoe size. They can run larger or smaller, both in width and length. Brands often fit similarly across all of their models. Make sure you have some wiggle room for your toes. If you can’t move your toes inside the boot; they might be too tight and will end up causing pain and discomfort. Stand downward on an incline. Does your foot slide forward causing your toes to press or curl against the front of the boot? This should not happen with a proper fit. Just imagine how your toes will feel after a long day walking up and down hills. Your foot should always stay put in the boot without sliding. How does the width of the boot feel? It should feel snug but not tight on the sides. If you feel too much pressure on the sides of your feet, you may need a wider version of that boot. Test the boots by walking around in them. Is there anything you notice about the boots that might cause blisters after extended wear? This should be a warning indicator that there will be a problem in the future. Adjust the laces if they are equipped with them. You can loosen or tighten according to your comfort. Always try on boots with socks that you would normally wear with them. Another way you can adjust the comfort level of your boots is to add comfort insoles. These can be beneficial for someone who is on their feet for many hours per day. Your boots should feel like an extension of your foot, and if you’re going to spend the money on a good pair of boots, then you might as well make sure that they are going to fit properly. Generally, law enforcement and military personnel require uniform inspections and pride themselves on looking their best. Boots are a significant part of the uniform, and you need to make them shine. Though it might seem like a simple task, proper shine does require a certain technique and several steps to polish boots adequately. First, you must create a proper work area by clearing off a table, then covering it with newspaper or other material that will keep your table clean. Before applying polish you must prepare the boots by removing any dust, dirt, or mud that can affect the polish application. This can be accomplished by using a stiff, synthetic bristled brush or horsehair brush. Make sure that all foreign material is removed, even on the soles. Read more about cleaning your boots. Besides removing dirt and mud from the boots, you might have to remove old built-up polish. Old polish can trap debris that can create imperfections in the shine. This can be done by using a cotton ball and rubbing alcohol. Keep in mind you don’t want to remove all of the old polish as you require an adhesive base for applying the new polish. Apply the polish. For those who are polishing their new boots for the first time, your boots will require a base coat. A base coat is a foundation for future polish. However, if you already have your base coat established, then skip the base coat application. First, you’ll want to have a cloth material, preferably a microfiber cloth, as it’s less likely to leave remnants of the material behind. Wrap your index finger into the cloth, then swirl it into the polish container to get an ample amount of polish on the cloth. Using small circular motions, apply the polish to the entire part of the boot that can be polished. Keep in mind that polish is applied in very thin layers, so you don’t want to goop on so much that it can’t be buffed easily. After the polish has been applied and allowed to set a few minutes, take another cloth and dampen it slightly. In the same fashion as you applied the polish the first time, put a very small amount of polish on the damp rag and continue using circular motions. You’ll want to do this multiple times, maintaining the moisture on the cloth as you go. If you notice that the cloth starts to build up polish, then rotate to a cleaner area. After you’ve reached the shine you’re looking for, buff your boots with another clean cloth. This step will eliminate any remaining residue and enhances the smooth shine. The work that police officers and tactical professionals perform require specific equipment in order to get the job done safely and efficiently. Boots are a small but necessary part of their uniform. It’s important that you do your research to find the best police boots and the best tactical boots available. After all, you put your life on the line every day, and you deserve the best work boot to serve you as well as you serve others. Our job is to help you with those choices and provide you information on the pros and cons of police and tactical boots. Your job already places you in uncomfortable situations, and your work boots shouldn’t.